Collaboration on projects becomes fairly easy with the email-in feature in ProofHub as you can perform important project activities even when you are not using the tool. ProofHub’s email-in lets you post comments, add tasks, upload files, and do lots more without needing to log in to your account. So, you can carry out your work without any limitations. 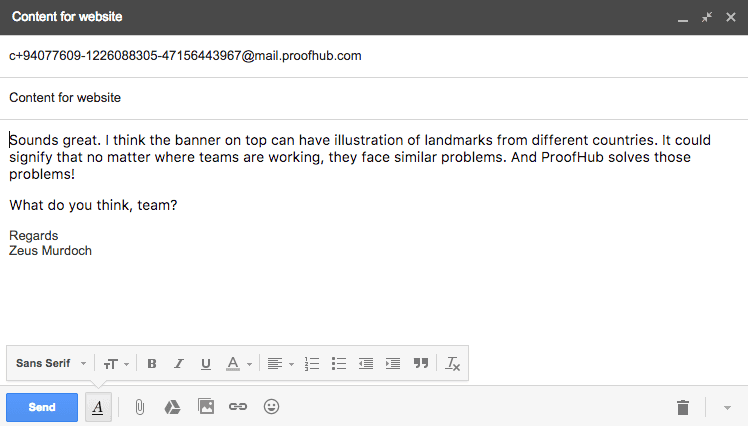 With email-in feature in ProofHub you can post comments on ongoing discussions using your emails. So, for times when you are not in office, or when you cannot access the tool, participating in discussions becomes quite easy. ProofHub simplifies the task management process by allowing you to add tasks directly in your projects from your inbox. Simply use the email-in address to add tasks and get your team to work. No need to log into your account to upload files when you are on the go. Simply use the email-in address to upload files that are either lying in your inbox or on in third party apps and make collaboration effortless. ProofHub’s email-in feature lets you reply directly to emails for various activities. Whether it is providing feedback, participate in discussions, adding new tasks, or anything else related to work - you can get it all done with ease! Finding it difficult to collaborate and staying connected with work? Give ProofHub a try.